For other people named Robert Burns, see Robert Burns (disambiguation). 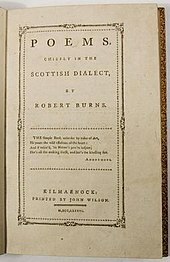 Robert Burns (25 January 1759 – 21 July 1796), also known familiarly as Rabbie Burns, the National Bard, Bard of Ayrshire and the Ploughman Poet and various other names and epithets,[nb 1] was a Scottish poet and lyricist. He is widely regarded as the national poet of Scotland and is celebrated worldwide. He is the best known of the poets who have written in the Scots language, although much of his writing is also in English and a light Scots dialect, accessible to an audience beyond Scotland. He also wrote in standard English, and in these writings his political or civil commentary is often at its bluntest. Portrait of Robert Burns, 1787. He had little regular schooling and got much of his education from his father, who taught his children reading, writing, arithmetic, geography, and history and also wrote for them A Manual Of Christian Belief. He was also taught by John Murdoch (1747–1824), who opened an "adventure school" in Alloway in 1763 and taught Latin, French, and mathematics to both Robert and his brother Gilbert (1760–1827) from 1765 to 1768 until Murdoch left the parish. After a few years of home education, Burns was sent to Dalrymple Parish School in mid-1772 before returning at harvest time to full-time farm labouring until 1773, when he was sent to lodge with Murdoch for three weeks to study grammar, French, and Latin. By the age of 15, Burns was the principal labourer at Mount Oliphant. During the harvest of 1774, he was assisted by Nelly Kilpatrick (1759–1820), who inspired his first attempt at poetry, "O, Once I Lov'd A Bonnie Lass". In 1775, he was sent to finish his education with a tutor at Kirkoswald, where he met Peggy Thompson (born 1762), to whom he wrote two songs, "Now Westlin' Winds" and "I Dream'd I Lay". Despite his ability and character, William Burnes was consistently unfortunate, and migrated with his large family from farm to farm without ever being able to improve his circumstances. At Whitsun, 1777, he removed his large family from the unfavourable conditions of Mount Oliphant to the 130-acre (0.53 km2) farm at Lochlea, near Tarbolton, where they stayed until William Burnes's death in 1784. Subsequently, the family became integrated into the community of Tarbolton. To his father's disapproval, Robert joined a country dancing school in 1779 and, with Gilbert, formed the Tarbolton Bachelors' Club the following year. His earliest existing letters date from this time, when he began making romantic overtures to Alison Begbie (b. 1762). In spite of four songs written for her and a suggestion that he was willing to marry her, she rejected him. In December 1781, Burns moved temporarily to Irvine to learn to become a flax-dresser, but during the workers' celebrations for New Year 1781/1782 (which included Burns as a participant) the flax shop caught fire and was burnt to the ground. This venture accordingly came to an end, and Burns went home to Lochlea farm. During this time he met and befriended Captain Richard Brown who encouraged him to become a poet. Robert and Gilbert made an ineffectual struggle to keep on the farm, but after its failure they moved to the farm at Mossgiel, near Mauchline, in March, which they maintained with an uphill fight for the next four years. In mid-1784 Burns came to know a group of girls known collectively as The Belles of Mauchline, one of whom was Jean Armour, the daughter of a stonemason from Mauchline. His first child, Elizabeth "Bess" Burns (1785–1817), was born to his mother's servant, Elizabeth Paton (1760–circa 1799), while he was embarking on a relationship with Jean Armour, who became pregnant with twins in March 1786. Burns signed a paper attesting his marriage to Jean, but her father "was in the greatest distress, and fainted away". To avoid disgrace, her parents sent her to live with her uncle in Paisley. Although Armour's father initially forbade it, they were eventually married in 1788. Armour bore him nine children, only three of whom survived infancy. Burns was in financial difficulties due to his want of success in farming, and to make enough money to support a family he took up an offer of work in Jamaica from Dr Patrick Douglas of Garrallan, Old Cumnock, whose sugar plantations outside Port Antonio were managed by his brother Charles, under whom Burns was to be a "book keeper" (assistant overseer of slaves). It has been suggested that that was a position for a single man, and that he would live in rustic conditions, not likely to be living in the great house at a salary of £30 per annum. Burns's egalitarian views were typified by "The Slave's Lament" six years later, but in 1786 there was little public awareness of the abolitionist movement that began about that time. The new edition of his poems brought Burns £400. His stay in the city also resulted in some lifelong friendships, among which were those with Lord Glencairn, and Frances Anna Dunlop (1730–1815), who became his occasional sponsor and with whom he corresponded for many years until a rift developed. He embarked on a relationship with the separated Agnes "Nancy" McLehose (1758–1841), with whom he exchanged passionate letters under pseudonyms (Burns called himself "Sylvander" and Nancy "Clarinda"). When it became clear that Nancy would not be easily seduced into a physical relationship, Burns moved on to Jenny Clow (1766–1792), Nancy's domestic servant, who bore him a son, Robert Burns Clow, in 1788. He also had an affair with a servant girl, Margaret "May" Cameron. His relationship with Nancy concluded in 1791 with a final meeting in Edinburgh before she sailed to Jamaica for what turned out to be a short-lived reconciliation with her estranged husband. Before she left, he sent her the manuscript of "Ae Fond Kiss" as a farewell. On his return from Edinburgh in February 1788, he resumed his relationship with Jean Armour and took a lease on Ellisland Farm, Dumfriesshire, settling there in June. He also trained as a gauger or exciseman in case farming continued to be unsuccessful. He was appointed to duties in Customs and Excise in 1789 and eventually gave up the farm in 1791. Meanwhile, in November 1790, he had written "Tam O' Shanter". About this time he was offered and declined an appointment in London on the staff of The Star newspaper, and refused to become a candidate for a newly created Chair of Agriculture in the University of Edinburgh, although influential friends offered to support his claims. He did however accept membership of the Royal Company of Archers in 1792. After giving up his farm, he removed to Dumfries. It was at this time that, being requested to write lyrics for The Melodies of Scotland, he responded by contributing over 100 songs. He made major contributions to George Thomson's A Select Collection of Original Scottish Airs for the Voice as well as to James Johnson's Scots Musical Museum. Arguably his claim to immortality chiefly rests on these volumes, which placed him in the front rank of lyric poets. As a songwriter he provided his own lyrics, sometimes adapted from traditional words. He put words to Scottish folk melodies and airs which he collected, and composed his own arrangements of the music including modifying tunes or recreating melodies on the basis of fragments. In letters he explained that he preferred simplicity, relating songs to spoken language which should be sung in traditional ways. The original instruments would be fiddle and the guitar of the period which was akin to a cittern, but the transcription of songs for piano has resulted in them usually being performed in classical concert or music hall styles. Thomson as a publisher commissioned arrangements of "Scottish, Welsh and Irish Airs" by such eminent composers of the day as Franz Haydn and Ludwig van Beethoven, with new lyrics. The contributors of lyrics included Burns. While such arrangements had wide popular appeal, Beethoven's music was more advanced and difficult to play than Thomson intended. Burns's worldly prospects were perhaps better than they had ever been; but he had become soured, and had alienated many of his friends by freely expressing sympathy with the French and American Revolutions and the advocates of reform and votes for all men. His political views came to the notice of his employers and in an attempt to prove his loyalty to the Crown, Burns joined the Royal Dumfries Volunteers in March 1795. As his health began to give way, he began to age prematurely and fell into fits of despondency. The habits of intemperance (alleged mainly by temperance activist James Currie) are said to have aggravated his long-standing possible rheumatic heart condition. 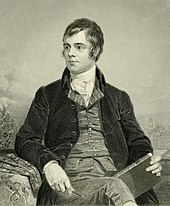 His themes included republicanism (he lived during the French Revolutionary period) and Radicalism, which he expressed covertly in "Scots Wha Hae", Scottish patriotism, anticlericalism, class inequalities, gender roles, commentary on the Scottish Kirk of his time, Scottish cultural identity, poverty, sexuality, and the beneficial aspects of popular socialising (carousing, Scotch whisky, folk songs, and so forth). The strong emotional highs and lows associated with many of Burns's poems have led some, such as Burns biographer Robert Crawford, to suggest that he suffered from manic depression—a hypothesis that has been supported by analysis of various samples of his handwriting. Burns himself referred to suffering from episodes of what he called "blue devilism". The National Trust for Scotland has downplayed the suggestion on the grounds that evidence is insufficient to support the claim. Scottish Canadians have embraced Robert Burns as a kind of patron poet and mark his birthday with festivities. 'Robbie Burns Day' is celebrated from Newfoundland and Labrador to Nanaimo. Every year, Canadian newspapers publish biographies of the poet, listings of local events and buffet menus. Universities mark the date in a range of ways: McMaster University library organized a special collection and Simon Fraser University's Centre for Scottish Studies organized a marathon reading of Burns's poetry. Senator Heath Macquarrie quipped of Canada's first Prime Minister that "While the lovable [Robbie] Burns went in for wine, women and song, his fellow Scot, John A. did not chase women and was not musical!" 'Gung Haggis Fat Choy' is a hybrid of Chinese New Year and Robbie Burns Day, celebrated in Vancouver since the late 1990s. An example of Burns's literary influence in the US is seen in the choice by novelist John Steinbeck of the title of his 1937 novel, Of Mice and Men, taken from a line in the second-to-last stanza of "To a Mouse": "The best laid schemes o' mice an' men / Gang aft agley." 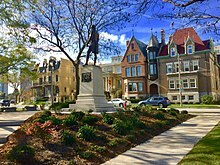 Burns's influence on American vernacular poets such as James Whitcomb Riley and Frank Lebby Stanton has been acknowledged by their biographers. When asked for the source of his greatest creative inspiration, singer songwriter Bob Dylan selected Burns's 1794 song "A Red, Red Rose" as the lyric that had the biggest effect on his life. The author J. D. Salinger used protagonist Holden Caulfield's misinterpretation of Burns's poem "Comin' Through the Rye" as his title and a main interpretation of Caulfield's grasping to his childhood in his 1951 novel The Catcher in the Rye. The poem, actually about a rendezvous, is thought by Caulfield to be about saving people from falling out of childhood. Burns became the "people's poet" of Russia. In Imperial Russia Burns was translated into Russian and became a source of inspiration for the ordinary, oppressed Russian people. In Soviet Russia, he was elevated as the archetypal poet of the people. As a great admirer of the egalitarian ethos behind the American and French Revolutions who expressed his own egalitarianism in poems such as his "Birthday Ode for George Washington" or his "Is There for Honest Poverty" (commonly known as "A Man's a Man for a' that"), Burns was well placed for endorsement by the Communist regime as a "progressive" artist. A new translation of Burns begun in 1924 by Samuil Marshak proved enormously popular, selling over 600,000 copies. The USSR honoured Burns with a commemorative stamp in 1956. He remains popular in Russia after the fall of the Soviet Union. 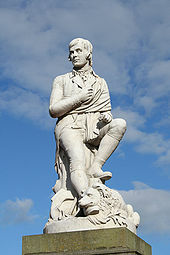 Significant 19th-century monuments to him stand in Alloway, Leith, and Dumfries. An early 20th-century replica of his birthplace cottage belonging to the Burns Club Atlanta stands in Atlanta, Georgia. 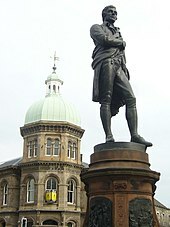 These are part of a large list of Burns memorials and statues around the world. In the suburb of Summerhill, Dumfries, the majority of the streets have names with Burns connotations. A British Rail Standard Class 7 steam locomotive was named after him, along with a later Class 87 electric locomotive, No. 87035. On 24 September 1996, Class 156 diesel unit 156433 was named "The Kilmarnock Edition" by Jimmy Knapp, General Secretary of the RMT union, at Girvan Station to launch the new "Burns Line" services between Girvan, Ayr, and Kilmarnock, supported by Strathclyde Passenger Transport (SPT). In 1976, singer Jean Redpath, in collaboration with composer Serge Hovey, started to record all of Burns's songs, with a mixture of traditional and Burns's own compositions. The project ended when Hovey died, after seven of the planned twenty-two volumes were completed. Redpath also recorded four cassettes of Burns's songs (re-issued as 3 CDs) for the Scots Musical Museum. The format of Burns suppers has changed little since. The basic format starts with a general welcome and announcements, followed with the Selkirk Grace. After the grace comes the piping and cutting of the haggis, when Burns's famous "Address to a Haggis" is read and the haggis is cut open. The event usually allows for people to start eating just after the haggis is presented. At the end of the meal, a series of toasts, often including a 'Toast to the Lassies', and replies are made. This is when the toast to "the immortal memory", an overview of Burns's life and work, is given. The event usually concludes with the singing of "Auld Lang Syne". In 2009, STV ran a television series and public vote on who was "The Greatest Scot" of all time. Robert Burns won, narrowly beating William Wallace. A bust of Burns is in the Hall of Heroes of the National Wallace Monument in Stirling. ^ Including Rabbie Burns, Scotland's favourite son, Robden of Solway Firth and simply the Bard. 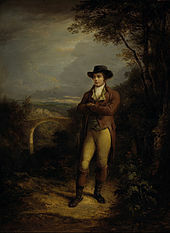 ^ "Hall of Fame: Robert Burns (1759-1796)". National Records of Scotland. Retrieved 14 April 2018. ^ "Robert Burns 1759 – 1796". The Robert Burns World Federation. Archived from the original on 27 September 2011. Retrieved 25 April 2011. ^ "Mauchline kirk session records, National Archives of Scotland". 'The Legacy of Robert Burns' feature on the National Archives of Scotland website. National Archives of Scotland. 1 July 2009. Retrieved 21 July 2009. ^ Crawford, Robert (30 April 2011). The Bard. Random House. pp. 222–223. ISBN 9781446466407. Retrieved 26 March 2018. ; Leask, Nigel (25 June 2009). "Burns and the Poetics of Abolition". In Carruthers, Gerard (ed.). Edinburgh Companion to Robert Burns. Edinburgh University Press. p. 51. ISBN 9780748636501. ; "Letter of Charles Douglas to Patrick Douglas dated Port Antonio 19th June 1786 (page 3 of 3) - Burns Scotland". Retrieved 26 March 2018. ^ a b c "Highland Mary (Mary Campbell)". Famous Sons and Daughters of Greenock. Nostalgic Greenock. Archived from the original on 20 February 2010. Retrieved 17 January 2010. ^ "Feature on The Poet Robert Burns". Robert Burns History. Scotland.org. 13 January 2004. Archived from the original on 27 February 2009. Retrieved 10 June 2009. ^ Rev. Thos. Thomson (1856). Chambers, R (ed.). "Significant Scots – Thomas Blacklock". Biographical Dictionary of Eminent Scotsmen. Blackie and Son. Retrieved 17 January 2010. ^ National Galleries of Scotland. "Artists A-Z − − N − Artists A-Z − Online Collection − Collection − National Galleries of Scotland". ^ "Diploma of the Royal Company of Archers". Burns' Scotland. Retrieved 3 November 2015. ^ David Sibbald. "Robert Burns the Song Writer". ^ "Folksong Arrangements by Haydn / Folksong Arrangements by Haydn and Beethoven / Projects / Home – Trio van Beethoven". ^ "Thomson's Select Melodies of Scotland, Ireland and Wales (Thomson, George)". ^ "25 Schottische Lieder, Op.108 (Beethoven, Ludwig van)". ^ "12 Schottische Lieder, WoO 156 (Beethoven, Ludwig van)". ^ Beethoven-Haus Bonn (1 April 2002). "Beethoven-Haus Bonn". 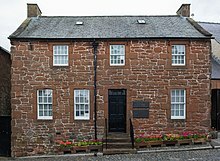 ^ "MS: 'The Dumfries Volunteers' – Robert Burns Birthplace Museum". ^ a b c Hogg, PS (2008). Robert Burns. The Patriot Bard. Edinburgh : Mainstream Publishing. ISBN 978-1-84596-412-2. p. 321. ^ "Thomas Hamilton, architect – Joe Rock's Research Pages". 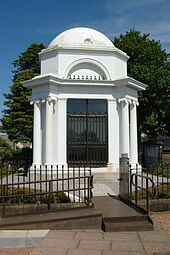 ^ "Robert Burns Mausoleum". Undiscovered Scotland. Retrieved 27 August 2014. ^ Hogg, PS (2008). Robert Burns. The Patriot Bard. Edinburgh : Mainstream Publishing. ISBN 978-1-84596-412-2. p. 154. ^ "Burness Genealogy and Family History – Person Page". Archived from the original on 17 January 2012. Retrieved 27 February 2012. ^ Rumens, C (16 January 2009). "The Bard, By Robert Crawford". Books. London: The Independent. Retrieved 10 June 2009. ^ "Ian Hunter: Robbie Burns was the everyman's poet". National Post. 25 January 2013. Archived from the original on 16 February 2013. Retrieved 27 January 2013. ^ "Happy Robbie Burns Day from the 'Bard' Himself!". McMaster University Library. 24 January 2013. Archived from the original on 1 February 2014. Retrieved 27 January 2013. ^ "Fans of Robbie Burns' poetry at SFU attempt to break their own world record". Global TV (BC). 25 January 2013. Archived from the original on 16 February 2013. Retrieved 27 January 2013. ^ "Ceremonies & Events: Robbie Burns Day". Simon Fraser University. January 2013. Archived from the original on 2 February 2014. Retrieved 27 January 2013. ^ "In Sir John A. 's Footsteps: The Virtual Tour". City of Kingston (Ontario). n.d. Archived from the original on 19 February 2013. Retrieved 27 January 2013. ^ Simpson, R (5 October 2008). "Bob Dylan names Scottish poet Robert Burns as his biggest inspiration". London: Daily Mail. Retrieved 13 July 2009. Bob Dylan has named his own greatest inspiration as the Scottish poet Robert Burns. The American singer-songwriter was asked to say which lyric or verse has had the biggest effect on his life. He selected the 1794 song "A Red, Red Rose", which is often published as a poem, penned by the man regarded as Scotland's national poet. ^ Michaels, S (6 October 2008). "Bob Dylan: Robert Burns is my biggest inspiration". London: The Guardian. Retrieved 11 June 2009. Dylan has revealed his greatest inspiration is Scotland's favourite son, the Bard of Ayrshire, the 18th-century poet known to most as Rabbie Burns. Dylan selected A Red, Red Rose, written by Burns in 1794. ^ "J. D. Salinger's Catcher in the Rye". Sparknotes. Retrieved 14 July 2010. When [Holden] tries to explain why he hates school, she accuses him of not liking anything. He tells her his fantasy of being "the catcher in the rye," a person who catches little children as they are about to fall off of a cliff. Phoebe tells him that he has misremembered the poem that he took the image from: Robert Burns's poem says "if a body meet a body, coming through the rye," not "catch a body." ^ "Burns Biography". Standrews.com. 27 January 1990. Archived from the original on 11 December 2004. Retrieved 10 June 2009. ^ Gordon, Carl (7 May 1980). "Oldest Burns club opens its doors to the lassies". The Glasgow Herald. p. 4. Retrieved 23 July 2017. ^ a b "Congratulation Greenock Burns Club". The Robert Burns World Federation Limited. Archived from the original on 26 January 2010. Retrieved 18 January 2010. ^ "Robbie Burns Day: 10 facts you never knew". Simcoe. 21 January 2015. 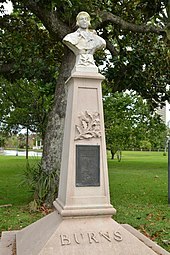 ^ "Camperdown's Robert Burns Festival". Victorian Government. Archived from the original on 13 June 2015. Retrieved 12 June 2015. ^ "The 2009 Robert Burns £2 Coin Pack". Archived from the original on 18 December 2008. Retrieved 5 January 2009. ^ "Clarinda – The Musical – No woman shunned Robert Burns' advances, until he met Clarinda!". Clarindathemusical.com. Archived from the original on 9 October 2006. Retrieved 10 June 2009. ^ "Our Own Robbie Burns (Tucker, Henry L.)". Burns, R (1993). Bold, A (ed.). Rhymer Rab: An Anthology of Poems and Prose. London: Black Swan. ISBN 1-84195-380-6. Burns, R (2003). Noble, A; Hogg, PS (eds.). The Canongate Burns: The Complete Poems and Songs of Robert Burns. Edinburgh: Canongate Books. ISBN 1-84195-380-6. "Archival material relating to Robert Burns". UK National Archives. Video and commentary on the World's largest image of Robert Burns, Ardeer, Ayrshire.